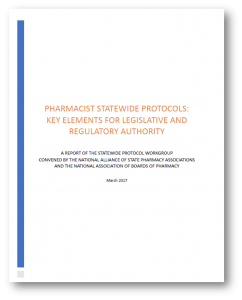 The Statewide Protocol Workgroup, convened by the National Alliance of State Pharmacy Associations and the National Association of Boards of Pharmacy, has developed policy recommendations for pharmacist statewide protocols. These recommendations include the key elements that should be included in state laws and regulations authorizing the development of statewide protocols – including the components that should be included in the protocol itself. Workgroup participants, pharmacists, and related stakeholders from a variety of settings who were selected based on their experience with statewide protocols and their knowledge and expertise in pharmacy policy, considered the existing landscape of state laws and regulations, patient access, and pharmacist education and training in compiling their recommendations. This work built upon the output of a stakeholder meeting assembled by NASPA and NABP in March 2016 to examine the issue of statewide protocols and make recommendations for resource needs and the process for development. The workgroup’s recommendations and background information on statewide protocols can be found in the report linked below. NASPA and NABP would like to thank Pfizer, Inc for their sponsorship, which helped to make this work possible and the workgroup participants who shared their time and talent to develop these recommendations.